Hotel online reputation management is a 24/7 job and requires real-time reaction. Revinate is pleased to announce that we are the first hospitality software company in the Online Reputation Management industry to offer a native iPhone application for hoteliers. Revinate customers can download the free app today from the Apple app store. Access Revinate’s new mobile app on your iPhone and easily search for reviews, monitor your feedback, respond to reviews, assign tickets, post to your social media accounts and keep your finger on the pulse of your reputation. I recently sat down with Revinate’s Director of Product Management, Matt Zarem, to discuss how Revinate’s mobile app will benefit hoteliers and why it’s so important. Why does a mobile app make sense for Online Reputation Management? The more closely aligned we can be to the daily business routine of our customers, the more effective we can be at improving efficiency and productivity for them. Our new mobile app means that hoteliers are no longer chained to their office desks to monitor online reputation and review key reputation metrics. Instead, Revinate is now available when and where it makes sense for a manager on the go. What can you do with Revinate’s ORM mobile app? Take action on reviews and social media mentions by directly responding on management sites, forwarding content as a text message or email, saving content for follow up later, posting to Facebook or Twitter, and more Receive in app notifications when new reviews arrive. 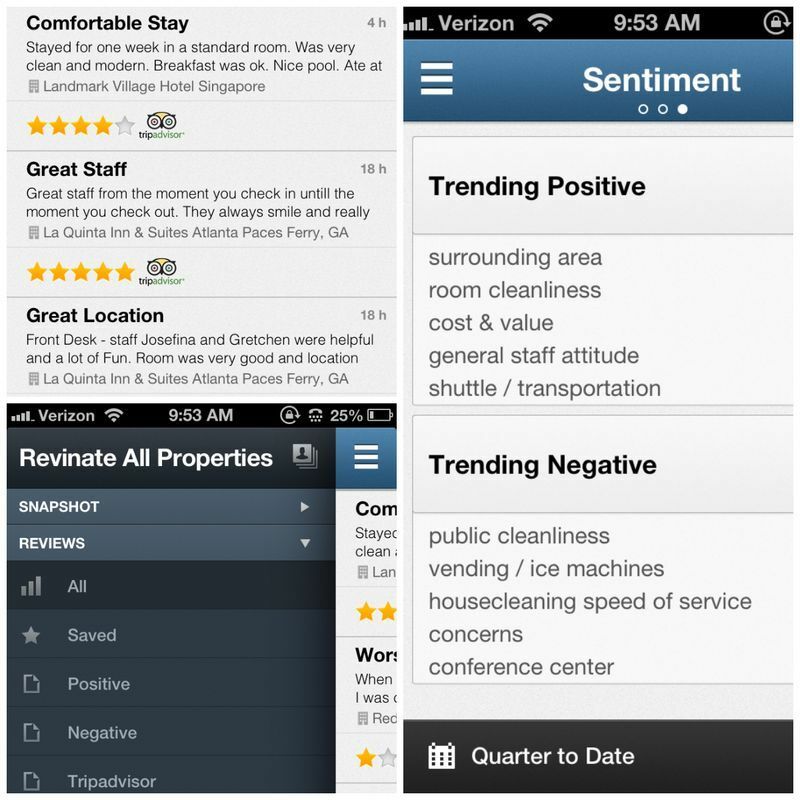 How do you envision hoteliers using the application? What are some use cases? Prior to beginning the project, I spent time with our customers to better understand their workflows and how they spend their days. I learned a lot about what they would find most valuable and how managers would benefit from a mobile app. Most important is simply the ability to access Revinate during off hours and while traveling to and from different properties. It is critical for them to be able to quickly and easily check on their review stream, on the go, and receive notifications when a new review arrives. What unique capabilities does the mobile app have over the desktop platform? We’re excited about the introduction of “views,” which allows managers to use a single tap on screen to switch from different filtered views of their review stream. “Views” is a fast and easy way for hoteliers to scan the content that matters most. Each of these “views” has a single icon at the top of the screen, which allows a single tap to turn in-app mobile notifications on or off for that view. This feature is a significant differentiator. Lastly, it made sense to exploit some native capabilities of the device such as integrated text messaging for forwarding a review to another colleague, and integration with the contact list for selecting recipients for various communications. How does the launch of this mobile app fit into where the industry is headed with mobile adoption? Across our existing customer base we’re certainly seeing the adoption of mobile devices grow. We recently achieved a key milestone when we saw more customers access the Revinate web app on a mobile device than a desktop browser that used to be a major traffic channel for us. This moment was a telling sign to us that mobile isn’t coming; it’s here now. What’s next in the mobile space for Revinate? We’re working hard to support more mobile devices, such as Android, as adoption continues to grow. Mobile is the next frontier for us and we will continue to work to ensure that our customers have access to their critical data at any time, from anywhere.